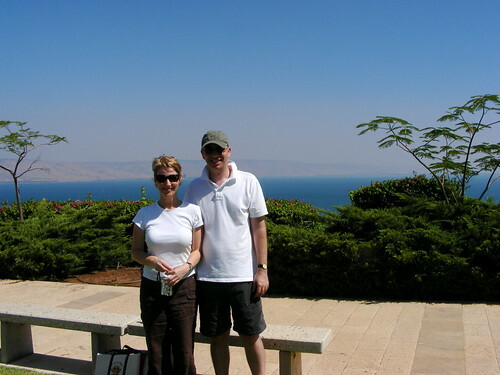 My co-hosts on the Something Beautiful Podcast, Jonathan and Thomas, asked Avril and I to share some reflections on our recent trip to the Holy Land for this week’s episode of the podcast. So, if you want to hear more about what we were up to and our thoughts on our trip then listen here. I doubt there is anyone who travels to the Holy Land without experiencing ‘the wall’. I’m sure there are lots of tourists who travel up and down the motorways and wonder why the roadside barriers are 10 feet tall but you can’t ignore it. I’m no expert. These are just my thoughts and reflections. If I’m wrong, tell me. If I’m right, tell me too. Nothing really prepares you for ‘the wall’. I’ve seen pictures, news reports and read other people’s blogs about it but that’s not the same as standing at a checkpoint watching people coming and going, or being turned away for no reason other than the soldier feels like it. 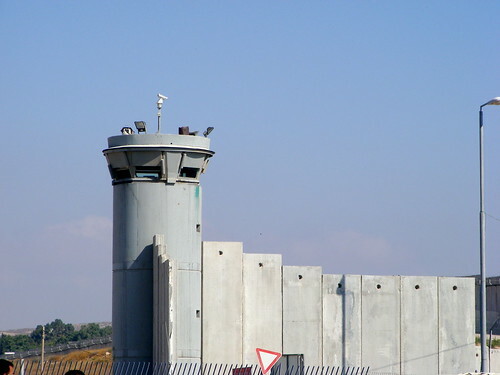 The Israelis call it the Security Wall. The Palestinians call it the Segregation Wall. I understand why Israel wants to keep who would blow up or shoot people out. But what I don’t get is the way in which they seem to have completely forgotten their history as a people. The very reason for the modern state of Israel’s existence was the Holocaust. In many cities throughout Europe the Nazis rounded up the Jews and forced to live in ghettos, walled in to separate them from everyone else. I’m not suggesting that Israel has set about the systematic extermination of the Palestinians but there are times when they seem to have come perilously close. I always thought ‘the wall’ was a border. It’s not. The wall zig-zags across the country, separating people from each other, farmers from their fields, families from their relatives and workers from their workplaces. Israel has deliberately fractured Palestinian society. People are caged in. Stopped from travelling. People who are not Jews have no status in Israel. They don’t get passports. They have ‘temporary residence cards’ instead, even those who have lived there all their lives. They are not allowed to build homes. If they do the army come along and bulldoze them. All of this doesn’t seem to be a recipe for peace. Separation breeds mistrust. Walls build division. Guns bread fear. And what have the Christian Church to say about all this? Well we make pronouncements. We support initiatives. The Church of Scotland has an £8million 5 Start hotel. In the Holy Land there seem to be two kinds of Christian. The ones who live there who are mostly Arabs and the ‘professional Christians’ who are stationed in Jerusalem or at other Holy Sites. The sad thing is that the Professional Christians seem more interested in fighting over who owns which bit of which Holy Site than actually contributing to the peace process. The Christians who live in the Holy Land seem stuck. They are stuck between the Jews and the Muslims. Because they are Arabs they don’t have the same rights as Jews in Israel. Because they are not Muslims they are often treated with mistrust in Palestine. They are stuck in the middle. But maybe the middle is a good place to be. Maybe the middle is the place that Jesus calls them to be. Blessed are the peacemakers after all. I wonder how we can help? I wonder how we can stand there in the middle with them? Any ideas about solving the world’s longest running conflict? I’m thinking getting rid of ‘the wall’ might be a start. This is my favourite photo from our trip. 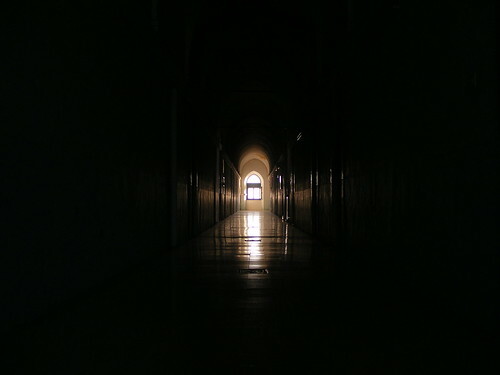 It’s not of anything special, just the corridor we lived in at Beit Gemal. But it sums up our trip for me… that there is light at the end of a dark tunnel. That the kids we worked with really are Hope in and for their community. The camp we were working at in the Holy Land ended with a moving time of worship and sharing followed by an hilarious talent show, mostly sending up the staff! I realise that I haven’t written much about the camp. I don’t want you to think that’s because it wasn’t great, it was. The young people were amazing and the people who run it are so inspiring. It’s just that they live in a situation where publicity isn’t all that helpful and I don’t want to make their lives any harder than they might be already. We had a couple of days in Jerusalem before coming home. We wandered the Old City for a while in the afternoon and went for a meal with Leo, John and Soo before they headed off to their camp with the young leaders. I wasn’t feeling all that well at diner and spent the next 24 hours being ill. When I recovered it was our last day. Pastor George suggested that we take a walk to the nearby Garden Tomb near the Damascus Gate and I’m glad that we did. 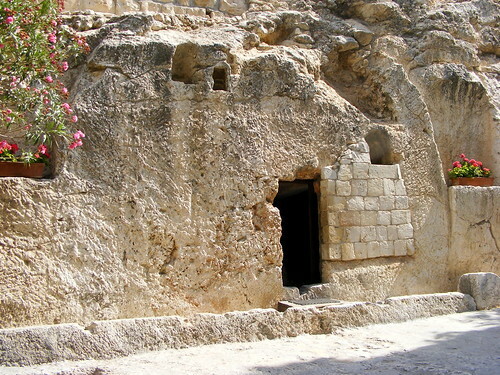 I found the Garden Tomb much more authentic than the Holy Sepulchre, perhaps because there isn’t a church built over the top of it! 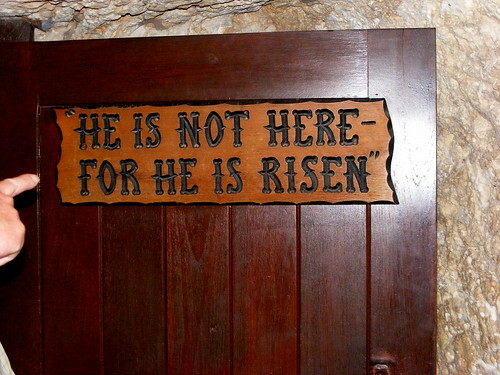 This version of the tomb is an actual tomb. In a garden. Near a hill outside the city wall. The hill even has a skull shaped erosion. As we waited to see inside the tomb the people who were inside emerged. They were from Ghana and the women began to sing joyfully. It was beautiful and very moving to see such spontaneous joy. For them, as for us, the sign on the door was the reason for coming. It’s not often you visit somewhere fully expecting the main attraction not to be there, but as I said in a previous post, that was my experience of the Holy Sites. There were hints and pointers to God but I found God in the kids we worked with and the adults we met, not in the buildings we visited. It was amazing to see where Jesus had been, where He walked and talked and taught, but the sign of reformed Christianity is an empty cross and that seems appropriate. It seems strange that Jesus was crucified for criticism of religiosity and yet churches full of ornaments mark every significant site where Jesus walked. It seems strange that Jesus command to his disciples was to love each other and yet his followers argue and fight over those Holy Sites. It seems strange that the temple curtain was torn when Jesus died, that a tomb could not contain God’s love, that God is on the loose and yet we try our best to put him back in a box where we can look and touch and control him. 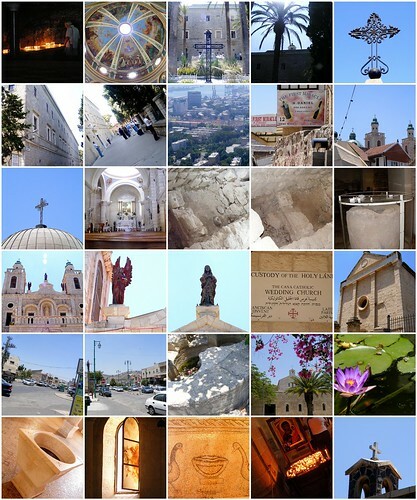 I forgot to say that the pick of my Holy Land trip photos are on Flickr if you want a look. Let me know what you think! Another early start for our trip into Jerusalem for Mass at Notre Dame and visits to the holy sites around the city. Mass was great with contributions from the kids and some beautiful singing and it was good to meet up with Leo, John and Sue from home. 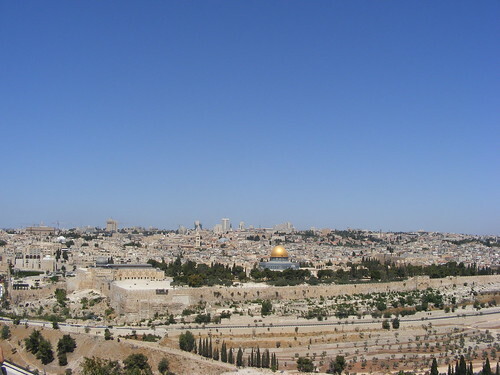 Our sightseeing today started at the top of the Mount of Olives and its spectacular view of the old city. 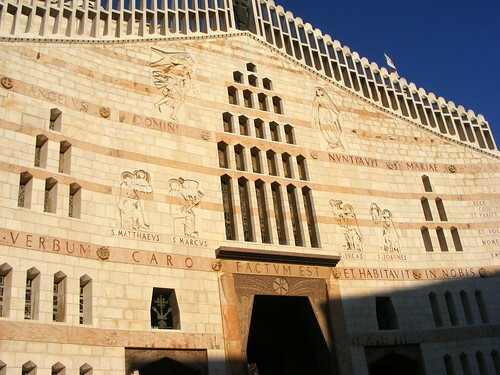 The beautiful Church of All Nations marks the site of the Garden of Gethsemane where Jesus went to pray after the Last Supper and where he was arrested. 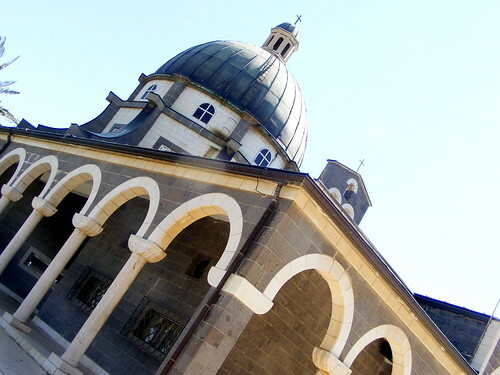 The church is simple and has 12 domes, one for each of the ‘nations’. We arrived near closing time (some of the churches are closed or close early on Sunday!) but the monk in charge allowed our group to stay and to read the passage from the Bible which describes Jesus time in Gethsemane. This was one of my favourite places of our visit. As we entered the Old City through St Stephen’s Gate we were immediately reminded of the Muslim influence on the city as the call to prayer echoed hauntingly across the rooftops. 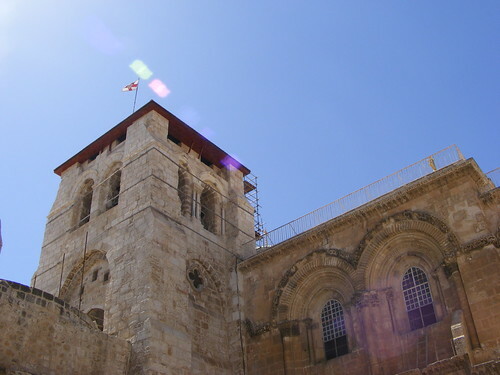 The Via Dolorosa is the traditional route of Christ’s journey to the cross. My impression is that it’s pretty unlikely that most of the churches mark the route Christ took but they do give a sense of the events of Good Friday. Our first stop was the Church of the Flagellation where Jesus was beaten and given his crown of thorns. 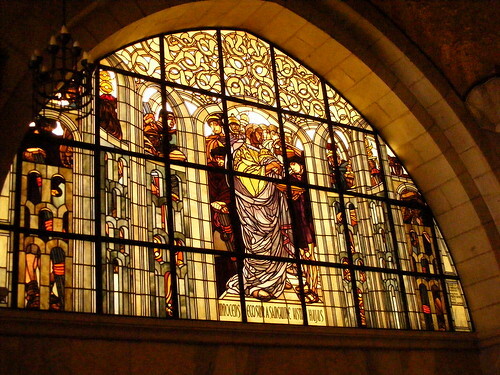 The stunning stained glass windows show Pilate washing his hands of the affair, Barabbas being released and Jesus being whipped. Across the courtyard is the next station, a small church marking where Jesus takes up his cross. 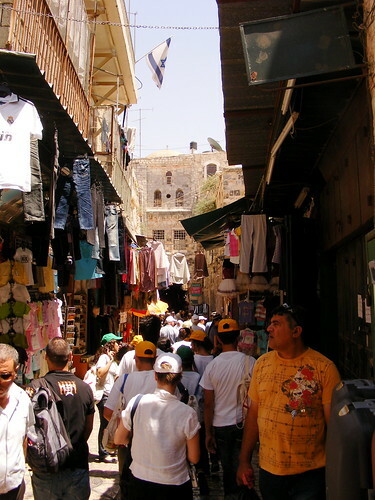 And then the route disappears into the busy, narrow streets of the souk. This was my first trip to the middle east and I’m not sure I was really prepared for the souk. I’ve read about it and seen similar markets on TV but the streets are so narrow and crowded that it’s hard not to feel uncomfortable, especially when you are looking after 40 kids! This is a magnificent building and supposedly contains all the final stations of the cross, Golgotha, the place where Jesus’ body was laid when he was taken down from the cross and the tomb. For me that doesn’t at all ring true. 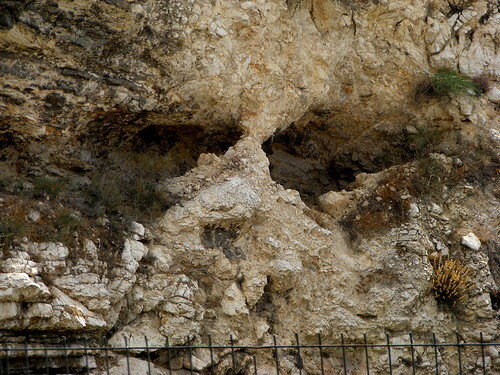 ‘Golgotha’ is a lump of rock about 1 story high with the tomb only 100 metres or so away at the other end of the church. It just seems to convenient and close. And that for me was the problem with Jerusalem. I loved the Old City. The architecture is amazing. The history, both ancient and recent, is palpable. It is a city of tension where Jews and Muslims and Christians exist uncomfortably together because that’s where their holy places are, places that mark where God has been… not necessarily where He is. 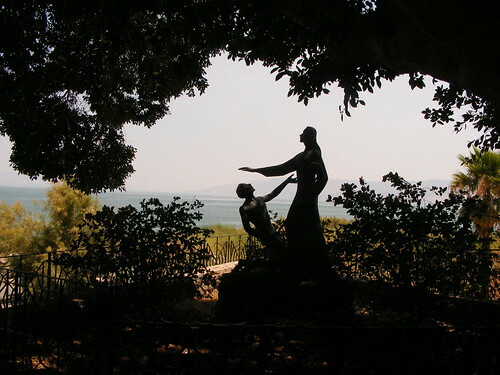 The spot where Peter declared Jesus to be the Son of God is a beautiful place next to the Sea of Galilee. This is where Jesus supposedly met the disciples on the shore and sent them out to fish on the lake. When they did they caught 153 fish (apparently the number of species of fish living in the lake). The church is simple with beautiful windows and a rock in the centre of the church, appropriate given its dedication to the rock Jesus would build His church on. The one thing I didn’t do was wander down to the water’s edge. I’m not sure why not. Perhaps it was the heat or the business, perhaps the speed boat buzzing around, but I didn’t, and now I’m home I wish I had. We had lunch here then visited the beautiful church which marks the venue of the Sermon on the Mount. The church sits on a hillside overlooking the Galilee. The sanctuary is octagonal and each of the eight sides has a window with the words of one of the Beatitudes in Latin. We had spent some time with the group on our first day thinking about the beatitudes and it felt appropriate, no matter how difficult, to be there with the young people thinking about peace, mourning, persecution and blessing. Relief from the 42C heat came in the shape of a boat. For me, this was one of the highlights of not only the day, but the trip. I mentioned in a previous post that almost all of the Holy Sites have a church built over them. This one, obviously, doesn’t. 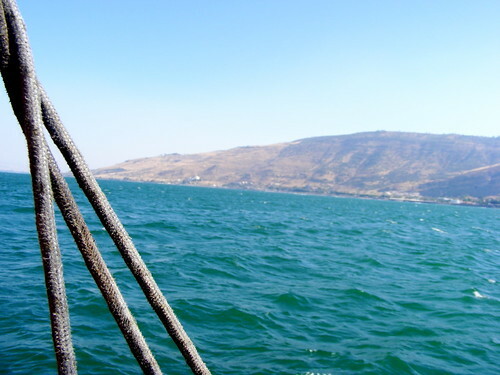 As we got on the boat the wind started to pick up and it was easy to imagine how quickly storms would blow up and to see the disciples huddled in the back of a small boat, riding out the storm. Our boat was slightly different though… our’s had dancing! We had around an hour sailing on the lake, thinking, reflecting and having great fun. 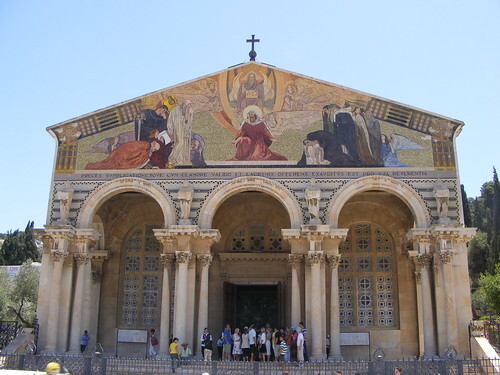 Our final stop of the day was the Basilica of the Annunciation in Nazareth. We arrived at closing time and Gerry and I were almost thrown out immediately. We entered the courtyard and started taking photos, unaware the 6pm was closing time and prayer time. The caretaker came running towards us shouting ‘No photos! Get out!!!’. Not a great start! But it was explained we were with the group and we were allowed into the church. I’m so glad we were. I have no photos from inside the church which I’m desperately sad about. It is a stunning building. Beautiful and modern and spacious and holy. It’s the place where Jesus lived and worked in the middle of a busy town with shops and lots of people going about their lives, just like Nazareth today. Faith is life, and life is faith. This whistle stop tour of the places where Jesus walked taught me that. We visited places where miracles happened, but those miracles all involved people. Real people searching for wholeness, healing and love. I think that’s what I found in the Holy Land.